A record 12 state tournament championships. Almost 50 years of elite status. A long list of college hockey and NHL representation. 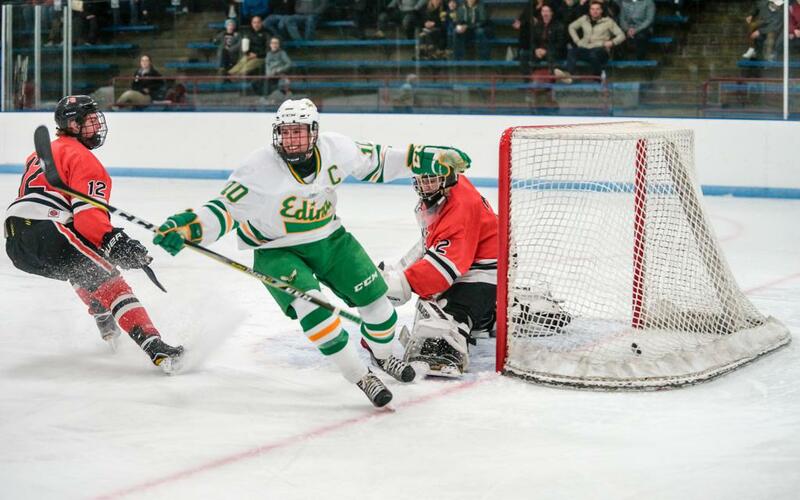 The tradition-rich Edina boys’ hockey program has checked all the important boxes but one. That changed Sunday when senior forward Sammy Walker became the first Hornets skater chosen as Mr. Hockey. The 34th annual award was presented at the St. Paul RiverCentre. Previously named the Star Tribune Metro Player of the Year, Walker was the Hornets’ catalyst this season. His great speed, playmaking and competitiveness produced 35 goals and 44 assists. Walker, a 5-11, 165-pound center, is committed to play for the Gophers. “I don’t think you’ll find a kid as loved by his teammates as Sammy is,” Edina coach Curt Giles said. “He’s as good to the guys on the top line with him as he is to the fourth-liners or the guys who come up from JV. Walker, a Hornets captain, credited the players in the locker room for making his job easy. The other Mr. Hockey finalists were Ben Almquist of Holy Family, George Grannis of Duluth Marshall, Demetrios Koumontzis of Edina, Luke LaMaster of Duluth East, Luke Loheit of Minnetonka, Lucas McGregor of Centennial, Carter Randklev of Moorhead, Colin Schmidt of Wayzata and Garrett Worth of Duluth East. The Mr. Hockey Award is selected by a panel of NHL scouts, junior scouts and coaches and college coaches. St. Thomas Academy’s Atticus Kelly won the Frank Brimsek Award, given to the state’s top senior goaltender. The other finalist was Rosemount’s Ben Garrity. Both awards are presented annually by the Minnesota Minute Men, a group that also recognized Lou Nanne with the inaugural Mr. Hockey Ambassador Award. The award given to an influential leader dedicated to the growth and development of hockey in Minnesota.